Ever spend an hour staring at your screen, struggling to compose an email that strikes just the right balance between polite and friendly, only to give up and go browse on Zappos? Us too! But with the tips below, none of us will have to wander the wasteland of email uncertainty any longer. You've got to think about a subject line like a headline for an article [...] We encourage people to make them specific, make them descriptive. We also encourage people to change the subject line when the subject of your communication changes. Her examples of unhelpful subject lines: "proposal," "meeting," and "hello." Better would be "the name of the meeting, the date, your specific request." Terk adds, "choose words carefully." "Hi" [...] immediately sends a reassuring signal that this message is coming with goodwill and it's a positive message and we're going to go forward. If it's appropriate, the "hi" is a nice way of connecting, immediately sending a signal of connection with the reader. The old-fashioned Dear Mr. So-and-so or Ms. So-and-so — that's having the exact opposite effect. It's emphasizing that this is a formal communication and it's an impersonal communication and it's probably an official communication. It's obvious that you should address your friends with "Hi" (if you're still bothering to address them) and the supervisor of the job you're applying for with "Dear." But sometimes the distinction's a little tougher — what if it's, say, somebody you need to talk to for work, but somebody not quite as scary and official as your Possible Eventual Boss? In situations like this I sometimes check out the person's website, and if the copy at any point refers to the person by first name only, I feel justified in the "Hi First-name" salutation. Absent those clues, though, you kind of have to take a leap of faith — think about how polite you want to be, and how much warmth you want to sacrifice for politeness, and if the answer is "a lot," then go with "Dear." After the greeting, if you can make some sort of personal connection, that will engage your reader. [...] If I've never met Mary but I'm hoping to set up a meeting with Mary about my fabulous new product, I might start with "Hi Mary, I got your name from Richard, who's one of my good friends from college and I know is a good friend of yours too." If you've met the recipient before, mention where you met them. Otherwise, maybe take a line to explain how you found out about them. "I love your blog/book/interpretive dance/casserole recipe" can be a good way of making a connection if you don't actually know any people in common. Basically, just give the person some idea of who the hell you are and how you came to e-mail them. I do not hesitate to put my request in the first line, because I'm a great believer that the most effective communication has to do with getting the message across immediately, as rapidly as possible. And the more that that message is embedded or the longer it takes to get to the key point of the message, the more trouble you're going to have communicating. So I tend to put the request out right away and then follow it with an explanation. If you're making a request, that explanation is key — says Terk, "show the reader why that action is important." But you don't have to go overboard with your explaining — your recipient can always ask you for more details if need be. Terk also points out that if you do need to get a lot of information across, a list with bullet points can be a good way to do so: "lists are a great way to save you time and save your reader time." Strong closings in email [...] have a few components: one of those is to wrap up, restate the main point. The second is to make a final personal connection if appropriate. And the third thing is to talk specifically about next steps. So, if you're asking for a meeting, then [you might say]: "I'm so glad Richard connected us and I really look forward to meeting you. Please consider meeting with me to discuss this opportunity. [...] If I haven't heard from you by next week, I will call you on Friday." If you say "talk to you soon," or more formally "I look forward to seeing you soon" or "I look forward to discussing this in greater detail," any forward-looking gestures of closure tend to send a positive note, whereas the unsigned email, the automatic signature or nothing at all will reinforce the impersonal nature. There is a tolerance for error in email that's much higher than it ever was in hard copy, simply because the speed of the medium is requiring us all to answer as fast as we can. But a high degree of error leads to loss of credibility, both in terms of who the writer is and in terms of the message itself. One typo is probably okay, but beware the email riddled with spelling errors. This is also a time to make sure that you've actually addressed the email to the right person (nobody likes getting a message with someone else's name at the top) and that you haven't replied-all to people who don't need the message. Says Taylor Bass, "Stop replying to all if not necessary. Reply to the person who sent the email and bcc (self) to keep a record." This can also be a time to do a final check for tone. Think your email sounds too cold? Baude says you should resist the urge to use the smiley (though let's be honest, we've all done it), and advocates instead "occasional conscious use of the exclamation point." She explains, "it is the most emotional mark of punctuation we have, so careful use of the exclamation point can communicate emotional openness and enthusiasm." 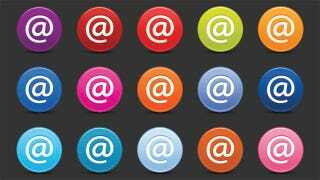 If you do all this, hopefully you'll be able to avoid email disasters. But if you don't, here are some tips for recovery. And remember, as Taylor Bass points out, if your message is really long and convoluted, you may have to just pick up the phone.